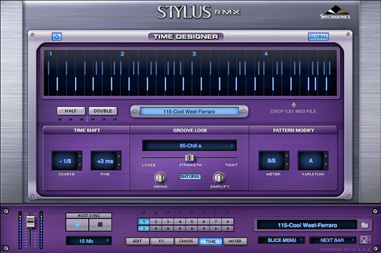 Spectrasonics has released Stylus RMX® version 1.7 featuring an innovative and completely new capability called ‘Time Designer™’ which intelligently transforms RMX audio loops into different time signatures and features the ability to “Groove Lock” the feel of any groove to another – all in real time. Time Designer also lets the user create instant pattern variations with smart algorithms based on musical rules, and to ‘simplify’ any RMX groove in a musical manner. Version 1.7 is also the first 64-bit native software release from Spectrasonics, includes all the new effects from Omnisphere and useful workflow enhancements to RMX, such as Suite Editing and Host Transport Sync. The new version is a free download for all registered users of Stylus RMX and is available now from the Updates Page. 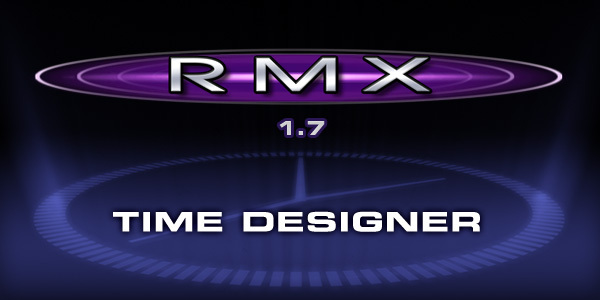 The new RMX version 1.7 contains a totally new way for users to browse and use their entire RMX library by offering the user the ability to Groove Lock any loop in real time to another loop or MIDI File. The user simply chooses a designated loop as the Groove Lock master, and switches one button (“Settings”): now all the loops that are played as the user browses are Groove Locked to that main feel. RMX’s Time Designer capabilities are available in any designated time signature. Once new Time Signatures are selected, the browsing experience works the same way – dramatically changing the experience of groove production in time signatures other than 4/4. Working on a 6/8 ballad? Simply choose 6/8 in Time Designer and the entire RMX library is now instantly available rearranged in 6/8 patterns! For multiple time signatures in a piece of music the user simply sets the first time signature variation, drags and drops the MIDI file to the sequencer, then sets the time signature to a new one and repeats the process for each section of music that requires a new time signature. The MIDI Files that are dragged to the host sequencer are “imprinted” with all the Groove Lock and Time Signature changes in the MIDI data, making it easy to customize the loops further. Time Designer’s Pattern Variation section allows the user to instantly check out useful variations on a loop. Time Designer makes rearrangements of the pattern based on a series of musical rules creating useful variations, and is available for all time signatures (including 4/4 pattern variations). Best of all, Time Designer and Chaos Designer can be used together! The Simplify function provides an easy way to instantly customize audio loops to better fit the user's music. Turning the Simplify knob takes out slices and makes more space for other musical parts. Used along with Groove Lock, Simplify allows the user to quickly layer synchronized grooves to create one-of-a-kind groove combinations. The Time Designer page shows a graphic of the groove’s time slices to give the user instant visual feedback along with the changing groove as the Simplify knob is turned. Anything in RMX can be used with Simplify including tonal, percussive and imported REX libraries. All Time Designer features also work with third party RMX libraries and imported REX files, as long as the grooves are sliced properly. All of the new effects from Spectrasonics’ Omnisphere have been added to RMX v1.7 as well: Formant Filter: Adds characteristics of the human vocal tract by chaining a narrow set of bandpass filters, set at specific frequencies, which reflect the formants of the human voice. Smoke Amp: An amp/speaker simulator with a full set of amplifier controls, speaker combinations and modeled versions of several classic guitar amplifiers. Ultra Chorus: A 'lush’ custom chorus, with a very dense, rich character compared with standard Chorus units. Retro-Phaser: A vibey sounding vintage Phaser, with more features than the EZ-Phaser and a dedicated page for tone shaping. Retro-Flanger: A vibey sounding vintage Flanger, with more features than the original Flanger and a dedicated page for tone shaping. Chorus Echo: Inspired by the classic Roland Chorus-Echo units from the 1970s, this unit combines both analog-style delay and chorusing, but includes new features, like stereo width control and a dedicated ‘Dirt’ control for a more gritty sound. RMX version 1.7 also sports several user-requested features such as Suite Editing for easy customization and better ‘Favorites’ management of users own collections of loops, sequencer Host Transport Sync so that RMX will follow the host sequencer’s transport controls and song position. The new version is also the first 64-bit native software release from Spectrasonics, keeping pace with the industry-wide move towards 64-bit systems and access to more RAM. Windows 64-bit compatibility has been released first in version 1.7, then a 64-bit Mac version of RMX will follow. 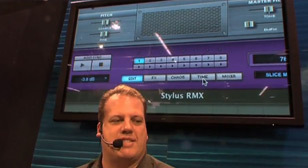 The full retail package of Stylus RMX Xpanded, which includes five S.A.G.E. Xpanders - has an MSRP of $399US/299Euro. Groundbreaking ability to rearrange audio loops into different time signatures in real-time! Make your own library of Time Designer Presets with your own REX or MIDI Files. RMX 1.7 includes native 64-bit support for Windows hosts. New Edit Buffer suite that acts as a temporary work area for editing and managing Custom Suites and Groove Menus. Edit Buffer suite is saved with the host session for later recall. Elements inside the Edit Buffer suite and be renamed and reordered. Elements inside custom suites can be deleted. Elements can be added to any Custom Suite by right-clicking on "Add". Formant Filter: Adds characteristics of the human vocal tract by chaining a narrow set of bandpass filters, set at specific frequencies, which reflect the formants of the human voice. Smoke Amp: An amp/speaker simulator with a full set of amplifier controls, speaker combinations and modeled versions of several classic guitar amplifiers. Ultra Chorus: A 'lush’ custom chorus, with a very dense, rich character compared with standard Chorus units. Retro-Phaser: A vibey sounding vintage Phaser, with more features than the EZ-Phaser and a dedicated page for tone shaping. Retro-Flanger: A vibey sounding vintage Flanger, with more features than the original Flanger and a dedicated page for tone shaping. Chorus Echo: Inspired by the classic Roland Chorus-Echo units from the 1970s, this unit combines both analog-style delay and chorusing, but includes new features, like stereo width control and a dedicated ‘Dirt’ control for a more gritty sound. Host Sync: The Host Sync Button enables RMX to sync with the transport controls in the host. When the Play button is activated in the host, all Host Synced Parts in RMX will also begin playing. The song position of the host is also synchronized to RMX when Host Sync is enabled. Groove Menu Mode Keyboard Display: In the Browser, when setting a Part to Groove Menu Mode, a keyboard display will show up next to the elements in the Suite. Making a selection in the Trigger Mode menu now sets the mode for all parts. To change the Trigger Mode just for the current Part, hold the Option/Alt key while selecting the desired Mode. Buzz Attenuation: New Chaos Page switch lowers the volume of the Buzz effect. Founded in 1994, Spectrasonics is a leading innovator of world-class, award-winning virtual instrument software plug-ins, used by the top recording artists, producers, remixers and film composers on the planet. Key Spectrasonics products include its flagship synthesizer Omnisphere®, the upcoming Trilian® Total Bass Module, and the Stylus RMX® Xpanded Realtime Groove Module.